Spring's Web MVC framework is designed around a DispatcherServlet that dispatches requests to handlers, with configurable handler mappings, view resolution, locale and theme resolution as well as support for upload files. The default handler is a very simple Controller interface, just offering a ModelAndView handleRequest(request,response) method. This can already be used for application controllers, but you will prefer the included implementation hierarchy, consisting of, for example AbstractController, AbstractCommandController and SimpleFormController. Application controllers will typically be subclasses of those. Note that you can choose an appropriate base class: if you don't have a form, you don't need a form controller. This is a major difference to Struts. One of the overarching design principles in Spring Web MVC (and in Spring in general) is the “Open for extension, closed for modification” principle. The reason that this principle is being mentioned here is because a number of methods in the core classes in Spring Web MVC are marked final. This means of course that you as a developer cannot override these methods to supply your own behavior... this is by design and has not been done arbitrarily to annoy. The book 'Expert Spring Web MVC and Web Flow' by Seth Ladd and others explains this principle and the reasons for adhering to it in some depth on page 117 (first edition) in the section entitled 'A Look At Design'. If you don't have access to the aforementioned book, then the following article may be of interest the next time you find yourself going “Gah! Why can't I override this method?” (if indeed you ever do). Note that you cannot add advice to final methods using Spring MVC. This means it won't be possible to add advice to for example the AbstractController.handleRequest() method. Refer to Section 6.6.1, “Understanding AOP proxies” for more information on AOP proxies and why you cannot add advice to final methods. Spring Web MVC allows you to use any object as a command or form object - there is no need to implement a framework-specific interface or base class. Spring's data binding is highly flexible: for example, it treats type mismatches as validation errors that can be evaluated by the application, not as system errors. All this means that you don't need to duplicate your business objects' properties as simple, untyped strings in your form objects just to be able to handle invalid submissions, or to convert the Strings properly. Instead, it is often preferable to bind directly to your business objects. This is another major difference to Struts which is built around required base classes such as Action and ActionForm. Compared to WebWork, Spring has more differentiated object roles. It supports the notion of a Controller, an optional command or form object, and a model that gets passed to the view. The model will normally include the command or form object but also arbitrary reference data; instead, a WebWork Action combines all those roles into one single object. WebWork does allow you to use existing business objects as part of your form, but only by making them bean properties of the respective Action class. Finally, the same Action instance that handles the request is used for evaluation and form population in the view. Thus, reference data needs to be modeled as bean properties of the Action too. These are (arguably) too many roles for one object. Spring's view resolution is extremely flexible. A Controller implementation can even write a view directly to the response (by returning null for the ModelAndView). In the normal case, a ModelAndView instance consists of a view name and a model Map, which contains bean names and corresponding objects (like a command or form, containing reference data). View name resolution is highly configurable, either via bean names, via a properties file, or via your own ViewResolver implementation. The fact that the model (the M in MVC) is based on the Map interface allows for the complete abstraction of the view technology. Any renderer can be integrated directly, whether JSP, Velocity, or any other rendering technology. The model Map is simply transformed into an appropriate format, such as JSP request attributes or a Velocity template model. There are several reasons why some projects will prefer to use other MVC implementations. Many teams expect to leverage their existing investment in skills and tools. In addition, there is a large body of knowledge and experience avalailable for the Struts framework. Thus, if you can live with Struts' architectural flaws, it can still be a viable choice for the web layer; the same applies to WebWork and other web MVC frameworks. If you don't want to use Spring's web MVC, but intend to leverage other solutions that Spring offers, you can integrate the web MVC framework of your choice with Spring easily. Simply start up a Spring root application context via its ContextLoaderListener, and access it via its ServletContext attribute (or Spring's respective helper method) from within a Struts or WebWork action. Note that there aren't any "plugins" involved, so no dedicated integration is necessary. From the web layer's point of view, you'll simply use Spring as a library, with the root application context instance as the entry point. All your registered beans and all of Spring's services can be at your fingertips even without Spring's web MVC. Spring doesn't compete with Struts or WebWork in this scenario, it just addresses the many areas that the pure web MVC frameworks don't, from bean configuration to data access and transaction handling. So you are able to enrich your application with a Spring middle tier and/or data access tier, even if you just want to use, for example, the transaction abstraction with JDBC or Hibernate. SWF integrates with existing frameworks like Spring MVC, Struts, and JSF, in both servlet and portlet environments. If you have a business process (or processes) that would benefit from a conversational model as opposed to a purely request model, then SWF may be the solution. For more information about SWF, consult the Spring WebFlow site. Clear separation of roles - controller, validator, command object, form object, model object, DispatcherServlet, handler mapping, view resolver, etc. Each role can be fulfilled by a specialized object. Powerful and straightforward configuration of both framework and application classes as JavaBeans, including easy referencing across contexts, such as from web controllers to business objects and validators. Adaptability, non-intrusiveness. Use whatever controller subclass you need (plain, command, form, wizard, multi-action, or a custom one) for a given scenario instead of deriving from a single controller for everything. Reusable business code - no need for duplication. You can use existing business objects as command or form objects instead of mirroring them in order to extend a particular framework base class. Customizable binding and validation - type mismatches as application-level validation errors that keep the offending value, localized date and number binding, etc instead of String-only form objects with manual parsing and conversion to business objects. Customizable handler mapping and view resolution - handler mapping and view resolution strategies range from simple URL-based configuration, to sophisticated, purpose-built resolution strategies. This is more flexible than some web MVC frameworks which mandate a particular technique. Flexible model transfer - model transfer via a name/value Map supports easy integration with any view technology. Customizable locale and theme resolution, support for JSPs with or without Spring tag library, support for JSTL, support for Velocity without the need for extra bridges, etc. Spring's web MVC framework is, like many other web MVC frameworks, request-driven, designed around a central servlet that dispatches requests to controllers and offers other functionality facilitating the development of web applications. Spring's DispatcherServlet however, does more than just that. It is completely integrated with the Spring IoC container and as such allows you to use every other feature that Spring has. 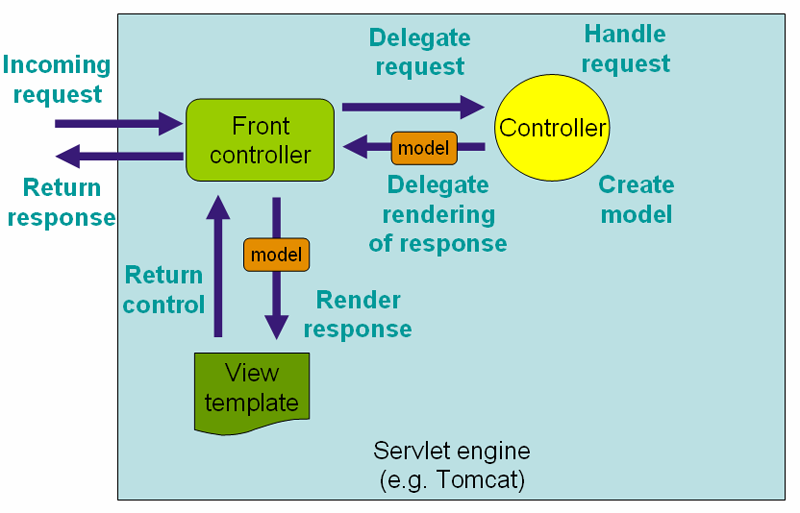 The request processing workflow of the Spring Web MVC DispatcherServlet is illustrated in the following diagram. The pattern-savvy reader will recognize that the DispatcherServlet is an expression of the “Front Controller” design pattern (this is a pattern that Spring Web MVC shares with many other leading web frameworks). The DispatcherServlet is an actual Servlet (it inherits from the HttpServlet base class), and as such is declared in the web.xml of your web application. Requests that you want the DispatcherServlet to handle will have to be mapped using a URL mapping in the same web.xml file. This is standard J2EE servlet configuration; an example of such a DispatcherServlet declaration and mapping can be found below. In the example above, all requests ending with .form will be handled by the 'example' DispatcherServlet. This is only the first step in setting up Spring Web MVC... the various beans used by the Spring Web MVC framework (over and above the DispatcherServlet itself) now need to be configured. As detailed in the section entitled Section 3.8, “The ApplicationContext”, ApplicationContext instances in Spring can be scoped. In the web MVC framework, each DispatcherServlet has its own WebApplicationContext, which inherits all the beans already defined in the root WebApplicationContext. These inherited beans defined can be overridden in the servlet-specific scope, and new scope-specific beans can be defined local to a given servlet instance. The framework will, on initialization of a DispatcherServlet, look for a file named [servlet-name]-servlet.xml in the WEB-INF directory of your web application and create the beans defined there (overriding the definitions of any beans defined with the same name in the global scope). With the above servlet configuration in place, you will need to have a file called '/WEB-INF/golfing-servlet.xml' in your application; this file will contain all of your Spring Web MVC-specific components (beans). The exact location of this configuration file can be changed via a servlet initialization parameter (see below for details). The WebApplicationContext is an extension of the plain ApplicationContext that has some extra features necessary for web applications. It differs from a normal ApplicationContext in that it is capable of resolving themes (see Section 13.7, “Using themes”), and that it knows which servlet it is associated with (by having a link to the ServletContext). The WebApplicationContext is bound in the ServletContext, and by using static methods on the RequestContextUtils class you can always lookup the WebApplicationContext in case you need access to it. The Spring DispatcherServlet has a couple of special beans it uses in order to be able to process requests and render the appropriate views. These beans are included in the Spring framework and can be configured in the WebApplicationContext, just as any other bean would be configured. Each of those beans is described in more detail below. Right now, we'll just mention them, just to let you know they exist and to enable us to go on talking about the DispatcherServlet. For most of the beans, sensible defaults are provided so you don't (initially) have to worry about configuring them. Controllers Controllers are the components that form the 'C' part of the MVC. The WebApplicationContext is searched for and bound in the request as an attribute in order for the controller and other elements in the process to use. It is bound by default under the key DispatcherServlet.WEB_APPLICATION_CONTEXT_ATTRIBUTE. The locale resolver is bound to the request to let elements in the process resolve the locale to use when processing the request (rendering the view, preparing data, etc.) If you don't use the resolver, it won't affect anything, so if you don't need locale resolving, you don't have to use it. The theme resolver is bound to the request to let elements such as views determine which theme to use. The theme resolver does not affect anything if you don't use it, so if you don't need themes you can just ignore it. If a multipart resolver is specified, the request is inspected for multiparts; if multiparts are found, the request is wrapped in a MultipartHttpServletRequest for further processing by other elements in the process. (See the section entitled Section 13.8.2, “Using the MultipartResolver” for further information about multipart handling). An appropriate handler is searched for. If a handler is found, the execution chain associated with the handler (preprocessors, postprocessors, and controllers) will be executed in order to prepare a model (for rendering). If a model is returned, the view is rendered. If no model is returned (which could be due to a pre- or postprocessor intercepting the request, for example, for security reasons), no view is rendered, since the request could already have been fulfilled. Exceptions that are thrown during processing of the request get picked up by any of the handler exception resolvers that are declared in the WebApplicationContext. Using these exception resolvers allows you to define custom behaviors in case such exceptions get thrown. The Spring DispatcherServlet also has support for returning the last-modification-date, as specified by the Servlet API. The process of determining the last modification date for a specific request is straightforward: the DispatcherServlet will first lookup an appropriate handler mapping and test if the handler that is found implements the interface LastModified interface. If so, the value of the long getLastModified(request) method of the LastModified interface is returned to the client. You can customize Spring's DispatcherServlet by adding context parameters in the web.xml file or servlet initialization parameters. The possibilities are listed below. contextClass Class that implements WebApplicationContext, which will be used to instantiate the context used by this servlet. If this parameter isn't specified, the XmlWebApplicationContext will be used. contextConfigLocation String which is passed to the context instance (specified by contextClass) to indicate where context(s) can be found. The string is potentially split up into multiple strings (using a comma as a delimiter) to support multiple contexts (in case of multiple context locations, of beans that are defined twice, the latest takes precedence). namespace the namespace of the WebApplicationContext. Defaults to [servlet-name]-servlet. The notion of a controller is part of the MVC design pattern (more specifically it is the 'C' in MVC. Controllers provide access to the application behavior which is typically defined by a service interface. Controllers interpret user input and transform such input into a sensible model which will be represented to the user by the view. Spring has implemented the notion of a controller in a very abstract way enabling a wide variety of different kinds of controllers to be created. Spring contains form-specific controllers, command-based controllers, and controllers that execute wizard-style logic, to name but a few. Spring's basis for the controller architecture is the org.springframework.web.servlet.mvc.Controller interface, the source code for which is listed below. As you can see, the Controller interface defines a single method that is responsible for handling a request and returning an appropriate model and view. These three concepts are the basis for the Spring MVC implementation - ModelAndView and Controller. While the Controller interface is quite abstract, Spring offers a lot of Controller implementations out of the box that already contain a lot of the functionality you might need. The Controller interface just defines the most basic responsibility required of every controller; namely handling a request and returning a model and a view. To provide a basic infrastructure, all of Spring's various Controller inherit from AbstractController, a class offering caching support and, for example, the setting of the mimetype. supportedMethods indicates what methods this controller should accept. Usually this is set to both GET and POST, but you can modify this to reflect the method you want to support. If a request is received with a method that is not supported by the controller, the client will be informed of this (expedited by the throwing of a ServletException). requiresSession indicates whether or not this controller requires a HTTP session to do its work. If a session is not present when such a controller receives a request, the user is informed of this by a ServletException being thrown. synchronizeSession use this if you want handling by this controller to be synchronized on the user's HTTP session. cacheSeconds when you want a controller to generate a caching directive in the HTTP response, specify a positive integer here. By default the value of this property is set to -1 so no caching directives will be included in the generated response. useExpiresHeader tweaks your controllers to specify the HTTP 1.0 compatible "Expires" header in the generated response. By default the value of this property is true. useCacheHeader tweaks your controllers to specify the HTTP 1.1 compatible "Cache-Control" header in the generated response. By default the value of this property is true. When using the AbstractController as the baseclass for your controllers you only have to override the handleRequestInternal(HttpServletRequest, HttpServletResponse) method, implement your logic, and return a ModelAndView object. Here is short example consisting of a class and a declaration in the web application context. The above class and the declaration in the web application context is all you need besides setting up a handler mapping (see the section entitled Section 13.4, “Handler mappings”) to get this very simple controller working. This controller will generate caching directives telling the client to cache things for 2 minutes before rechecking. This controller also returns a hard-coded view (which is typically considered bad practice). Although you can extend AbstractController, Spring provides a number of concrete implementations which offer functionality that is commonly used in simple MVC applications. The ParameterizableViewController is basically the same as the example above, except for the fact that you can specify the view name that it will return in the web application context (and thus remove the need to hard-code the viewname in the Java class). The UrlFilenameViewController inspects the URL and retrieves the filename of the file request and uses that as a viewname. For example, the filename of http://www.springframework.org/index.html request is index. Spring offers a multi-action controller with which you aggregate multiple actions into one controller, thus grouping functionality together. The multi-action controller lives in a separate package - org.springframework.web.servlet.mvc.multiaction - and is capable of mapping requests to method names and then invoking the right method name. Using the multi-action controller is especially handy when you have a lot of common functionality in one controller, but want to have multiple entry points to the controller, for example, to tweak behavior. delegate there are two usage-scenarios for the MultiActionController. Either you subclass the MultiActionController and specify the methods that will be resolved by the MethodNameResolver on the subclass (in which case you don't need to set the delegate), or you define a delegate object, on which methods resolved by the MethodNameResolver will be invoked. If you choose this scenario, you will have to define the delegate using this configuration parameter as a collaborator. methodNameResolver the MultiActionController needs a strategy to resolve the method it has to invoke, based on the incoming request. This strategy is defined by the MethodNameResolver interface; the MultiActionController exposes a property sp that you can supply a resolver that is capable of doing that. Please note that method overloading is not allowed since it would confuse the MultiActionController. Furthermore, you can define exception handlers capable of handling exceptions that are thrown by the methods you specify. The (optional) Exception argument can be any exception, as long as it's a subclass of java.lang.Exception or java.lang.RuntimeException. The (optional) AnyObject argument can be any class. Request parameters will be bound onto this object for convenient consumption. Find below some examples of valid MultiActionController method signatures. The standard signature (mirrors the Controller interface method). The signature for an Exception handling method. This signature has a void return type (see the section entitled Section 13.11, “Convention over configuration” below). This signature has a Map return type (see the section entitled Section 13.11, “Convention over configuration” below). The MethodNameResolver is responsible for resolving method names based on the request coming in. Find below details about the three MethodNameResolver implementations that Spring provides out of the box. ParameterMethodNameResolver - capable of resolving a request parameter and using that as the method name (http://www.sf.net/index.view?testParam=testIt will result in a method testIt(HttpServletRequest, HttpServletResponse) being called). The paramName property specifies the request parameter that is to be inspected). InternalPathMethodNameResolver - retrieves the filename from the request path and uses that as the method name (http://www.sf.net/testing.view will result in a method testing(HttpServletRequest, HttpServletResponse) being called). PropertiesMethodNameResolver - uses a user-defined properties object with request URLs mapped to method names. When the properties contain /index/welcome.html=doIt and a request to /index/welcome.html comes in, the doIt(HttpServletRequest, HttpServletResponse) method is called. This method name resolver works with the PathMatcher, so if the properties contained /**/welcom?.html, it would also have worked! Spring's command controllers are a fundamental part of the Spring Web MVC package. Command controllers provide a way to interact with data objects and dynamically bind parameters from the HttpServletRequest to the data object specified. They perform a somewhat similar role to the Struts ActionForm, but in Spring, your data objects don't have to implement a framework-specific interface. First, lets examine what command controllers are available straight out of the box. AbstractCommandController - a command controller you can use to create your own command controller, capable of binding request parameters to a data object you specify. This class does not offer form functionality; it does however offer validation features and lets you specify in the controller itself what to do with the command object that has been populated with request parameter values. AbstractFormController - an abstract controller offering form submission support. Using this controller you can model forms and populate them using a command object you retrieve in the controller. After a user has filled the form, the AbstractFormController binds the fields, validates the command object, and hands the object back to the controller to take the appropriate action. Supported features are: invalid form submission (resubmission), validation, and normal form workflow. You implement methods to determine which views are used for form presentation and success. Use this controller if you need forms, but don't want to specify what views you're going to show the user in the application context. SimpleFormController - a form controller that provides even more support when creating a form with a corresponding command object. The SimpleFormController let's you specify a command object, a viewname for the form, a viewname for page you want to show the user when form submission has succeeded, and more. AbstractWizardFormController - as the class name suggests, this is an abstract class - your wizard controller should extend it. This means you have to implement the validatePage(), processFinish() and processCancel() methods. You probably also want to write a contractor, which should at the very least call setPages() and setCommandName(). The former takes as its argument an array of type String. This array is the list of views which comprise your wizard. The latter takes as its argument a String, which will be used to refer to your command object from within your views. As with any instance of AbstractFormController, you are required to use a command object - a JavaBean which will be populated with the data from your forms. You can do this in one of two ways: either call setCommandClass() from the constructor with the class of your command object, or implement the formBackingObject() method. AbstractWizardFormController has a number of concrete methods that you may wish to override. Of these, the ones you are likely to find most useful are: referenceData(..) which you can use to pass model data to your view in the form of a Map; getTargetPage() if your wizard needs to change page order or omit pages dynamically; and onBindAndValidate() if you want to override the built-in binding and validation workflow. Finally, it is worth pointing out the setAllowDirtyBack() and setAllowDirtyForward(), which you can call from getTargetPage() to allow users to move backwards and forwards in the wizard even if validation fails for the current page. For a full list of methods, see the Javadoc for AbstractWizardFormController. There is an implemented example of this wizard in the jPetStore included in the Spring distribution: org.springframework.samples.jpetstore.web.spring.OrderFormController. Using a handler mapping you can map incoming web requests to appropriate handlers. There are some handler mappings you can use out of the box, for example, the SimpleUrlHandlerMapping or the BeanNameUrlHandlerMapping, but let's first examine the general concept of a HandlerMapping. The functionality a basic HandlerMapping provides is the delivering of a HandlerExecutionChain, which must contain the handler that matches the incoming request, and may also contain a list of handler interceptors that are applied to the request. When a request comes in, the DispatcherServlet will hand it over to the handler mapping to let it inspect the request and come up with an appropriate HandlerExecutionChain. Then the DispatcherServlet will execute the handler and interceptors in the chain (if any). The concept of configurable handler mappings that can optionally contain interceptors (executed before or after the actual handler was executed, or both) is extremely powerful. A lot of supporting functionality can be built into custom HandlerMappings. Think of a custom handler mapping that chooses a handler not only based on the URL of the request coming in, but also on a specific state of the session associated with the request. interceptors: the list of interceptors to use. HandlerInterceptors are discussed in Section 13.4.3, “Intercepting requests - the HandlerInterceptor interface”. defaultHandler: the default handler to use, when this handler mapping does not result in a matching handler. order: based on the value of the order property (see the org.springframework.core.Ordered interface), Spring will sort all handler mappings available in the context and apply the first matching handler. alwaysUseFullPath: if this property is set to true, Spring will use the full path within the current servlet context to find an appropriate handler. If this property is set to false (the default), the path within the current servlet mapping will be used. For example, if a servlet is mapped using /testing/* and the alwaysUseFullPath property is set to true, /testing/viewPage.html would be used, whereas if the property is set to false, /viewPage.html would be used. urlPathHelper: using this property, you can tweak the UrlPathHelper used when inspecting URLs. Normally, you shouldn't have to change the default value. urlDecode: the default value for this property is false. The HttpServletRequest returns request URLs and URIs that are not decoded. If you do want them to be decoded before a HandlerMapping uses them to find an appropriate handler, you have to set this to true (note that this requires JDK 1.4). The decoding method uses either the encoding specified by the request or the default ISO-8859-1 encoding scheme. lazyInitHandlers: allows for lazy initialization of singleton handlers (prototype handlers are always lazily initialized). Default value is false. (Note: the last four properties are only available to subclasses of org.springframework.web.servlet.handler.AbstractUrlHandlerMapping). All incoming requests for the URL /editaccount.form will now be handled by the form Controller in the source listing above. Of course we have to define a servlet-mapping in web.xml as well, to let through all the requests ending with .form. If you want to use the BeanNameUrlHandlerMapping, you don't necessarily have to define it in the web application context (as indicated above). By default, if no handler mapping can be found in the context, the DispatcherServlet creates a BeanNameUrlHandlerMapping for you! The above web.xml configuration snippet enables all requests ending with .html and .form to be handled by the sample dispatcher servlet. This handler mapping routes requests for 'help.html' in any directory to the 'helpController', which is a UrlFilenameViewController (more about controllers can be found in the section entitled Section 13.3, “Controllers”). Requests for a resource beginning with 'view', and ending with '.html' in the directory 'ex' will be routed to the 'helpController'. Two further mappings are also defined for 'editAccountFormController'. Spring's handler mapping mechanism has the notion of handler interceptors, that can be extremely useful when you want to apply specific functionality to certain requests, for example, checking for a principal. Interceptors located in the handler mapping must implement HandlerInterceptor from the org.springframework.web.servlet package. This interface defines three methods, one that will be called before the actual handler will be executed, one that will be called after the handler is executed, and one that is called after the complete request has finished. These three methods should provide enough flexibility to do all kinds of pre- and post-processing. The preHandle(..) method returns a boolean value. You can use this method to break or continue the processing of the execution chain. When this method returns true, the handler execution chain will continue, when it returns false, the DispatcherServlet assumes the interceptor itself has taken care of requests (and, for example, rendered an appropriate view) and does not continue executing the other interceptors and the actual handler in the execution chain. The following example provides an interceptor that intercepts all requests and reroutes the user to a specific page if the time is not between 9 a.m. and 6 p.m.
Any request coming in, will be intercepted by the TimeBasedAccessInterceptor, and if the current time is outside office hours, the user will be redirected to a static html file, saying, for example, he can only access the website during office hours. As you can see, Spring has an adapter class (the cunningly named HandlerInterceptorAdapter) to make it easier to extend the HandlerInterceptor interface. All MVC frameworks for web applications provide a way to address views. Spring provides view resolvers, which enable you to render models in a browser without tying you to a specific view technology. Out of the box, Spring enables you to use JSPs, Velocity templates and XSLT views, for example. The section entitled Chapter 14, Integrating view technologies has details of how to integrate and use a number of disparate view technologies. The two interfaces which are important to the way Spring handles views are ViewResolver and View. The ViewResolver provides a mapping between view names and actual views. The View interface addresses the preparation of the request and hands the request over to one of the view technologies. As discussed in the section entitled Section 13.3, “Controllers”, all controllers in the Spring Web MVC framework return a ModelAndView instance. Views in Spring are addressed by a view name and are resolved by a view resolver. Spring comes with quite a few view resolvers. We'll list most of them and then provide a couple of examples. AbstractCachingViewResolver An abstract view resolver which takes care of caching views. Often views need preparation before they can be used, extending this view resolver provides caching of views. XmlViewResolver An implementation of ViewResolver that accepts a configuration file written in XML with the same DTD as Spring's XML bean factories. The default configuration file is /WEB-INF/views.xml. ResourceBundleViewResolver An implementation of ViewResolver that uses bean definitions in a ResourceBundle, specified by the bundle basename. The bundle is typically defined in a properties file, located in the classpath. The default file name is views.properties. UrlBasedViewResolver A simple implementation of the ViewResolver interface that effects the direct resolution of symbolic view names to URLs, without an explicit mapping definition. This is appropriate if your symbolic names match the names of your view resources in a straightforward manner, without the need for arbitrary mappings. InternalResourceViewResolver A convenience subclass of UrlBasedViewResolver that supports InternalResourceView (i.e. Servlets and JSPs), and subclasses such as JstlView and TilesView. The view class for all views generated by this resolver can be specified via setViewClass(..). See the Javadocs for the UrlBasedViewResolver class for details. VelocityViewResolver / FreeMarkerViewResolver A convenience subclass of UrlBasedViewResolver that supports VelocityView (i.e. Velocity templates) or FreeMarkerView respectively and custom subclasses of them. As an example, when using JSP for a view technology you can use the UrlBasedViewResolver. This view resolver translates a view name to a URL and hands the request over the RequestDispatcher to render the view. When returning test as a viewname, this view resolver will hand the request over to the RequestDispatcher that will send the request to /WEB-INF/jsp/test.jsp. The ResourceBundleViewResolver inspects the ResourceBundle identified by the basename, and for each view it is supposed to resolve, it uses the value of the property [viewname].class as the view class and the value of the property [viewname].url as the view url. As you can see, you can identify a parent view, from which all views in the properties file sort of extend. This way you can specify a default view class, for example. A note on caching - subclasses of AbstractCachingViewResolver cache view instances they have resolved. This greatly improves performance when using certain view technologies. It's possible to turn off the cache, by setting the cache property to false. Furthermore, if you have the requirement to be able to refresh a certain view at runtime (for example when a Velocity template has been modified), you can use the removeFromCache(String viewName, Locale loc) method. Spring supports more than just one view resolver. This allows you to chain resolvers and, for example, override specific views in certain circumstances. Chaining view resolvers is pretty straightforward - just add more than one resolver to your application context and, if necessary, set the order property to specify an order. Remember, the higher the order property, the later the view resolver will be positioned in the chain. If a specific view resolver does not result in a view, Spring will inspect the context to see if other view resolvers are configured. If there are additional view resolvers, it will continue to inspect them. If not, it will throw an Exception. You have to keep something else in mind - the contract of a view resolver mentions that a view resolver can return null to indicate the view could not be found. Not all view resolvers do this however! This is because in some cases, the resolver simply cannot detect whether or not the view exists. For example, the InternalResourceViewResolver uses the RequestDispatcher internally, and dispatching is the only way to figure out if a JSP exists - this can only be done once. The same holds for the VelocityViewResolver and some others. Check the Javadoc for the view resolver to see if you're dealing with a view resolver that does not report non-existing views. As a result of this, putting an InternalResourceViewResolver in the chain in a place other than the last, will result in the chain not being fully inspected, since the InternalResourceViewResolver will always return a view! As has been mentioned, a controller normally returns a logical view name, which a view resolver resolves to a particular view technology. For view technologies such as JSPs that are actually processed via the Servlet/JSP engine, this is normally handled via InternalResourceViewResolver / InternalResourceView which will ultimately end up issuing an internal forward or include, via the Servlet API's RequestDispatcher.forward(..) or RequestDispatcher.include(). For other view technologies, such as Velocity, XSLT, etc., the view itself produces the content on the response stream. It is sometimes desirable to issue an HTTP redirect back to the client, before the view is rendered. This is desirable for example when one controller has been called with POSTed data, and the response is actually a delegation to another controller (for example on a successful form submission). In this case, a normal internal forward will mean the other controller will also see the same POST data, which is potentially problematic if it can confuse it with other expected data. Another reason to do a redirect before displaying the result is that this will eliminate the possibility of the user doing a double submission of form data. The browser will have sent the initial POST, will have seen a redirect back and done a subsequent GET because of that, and thus as far as it is concerned, the current page does not reflect the result of a POST, but rather of a GET, so there is no way the user can accidentally re-POST the same data by doing a refresh. The refresh would just force a GET of the result page, not a resend of the initial POST data. One way to force a redirect as the result of a controller response is for the controller to create and return an instance of Spring's RedirectView. In this case, DispatcherServlet will not use the normal view resolution mechanism, but rather as it has been given the (redirect) view already, will just ask it to do its work. The RedirectView simply ends up issuing an HttpServletResponse.sendRedirect() call, which will come back to the client browser as an HTTP redirect. All model attributes are simply exposed as HTTP query parameters. This does mean that the model must contain only objects (generally Strings or convertible to Strings) which can be readily converted to a string-form HTTP query parameter. If using RedirectView and the view is created by the controller itself, it is preferable for the redirect URL to be injected into the controller so that it is not baked into the controller but configured in the context along with the view names. While the use of RedirectView works fine, if the controller itself is creating the RedirectView, there is no getting around the fact that the controller is aware that a redirection is happening. This is really suboptimal and couples things too tightly. The controller should not really care about how the response gets handled... it should generally think only in terms of view names that have been injected into it. The special redirect: prefix allows this to be achieved. If a view name is returned which has the prefix redirect:, then UrlBasedViewResolver (and all subclasses) will recognize this as a special indication that a redirect is needed. The rest of the view name will be treated as the redirect URL. The net effect is the same as if the controller had returned a RedirectView, but now the controller itself can deal just in terms of logical view names. A logical view name such as redirect:/my/response/controller.html will redirect relative to the current servlet context, while a name such as redirect:http://myhost.com/some/arbitrary/path.html will redirect to an absolute URL. The important thing is that as long is this redirect view name is injected into the controller like any other logical view name, the controller is not even aware that redirection is happening. As with the redirect: prefix, if the view name with the prefix is just injected into the controller, the controller does not have to be aware that anything special is happening in terms of handling the response. Most parts of Spring's architecture support internationalization, just as the Spring web MVC framework does. DispatcherServlet enables you to automatically resolve messages using the client's locale. This is done with LocaleResolver objects. When a request comes in, the DispatcherServlet looks for a locale resolver and if it finds one it tries to use it to set the locale. Using the RequestContext.getLocale() method, you can always retrieve the locale that was resolved by the locale resolver. Besides the automatic locale resolution, you can also attach an interceptor to the handler mapping (see Section 13.4.3, “Intercepting requests - the HandlerInterceptor interface” for more information on handler mapping interceptors), to change the locale under specific circumstances, based on a parameter in the request, for example. Locale resolvers and interceptors are all defined in the org.springframework.web.servlet.i18n package, and are configured in your application context in the normal way. Here is a selection of the locale resolvers included in Spring. This locale resolver inspects the accept-language header in the request that was sent by the browser of the client. Usually this header field contains the locale of the client's operating system. This locale resolver inspects a Cookie that might exist on the client, to see if a locale is specified. If so, it uses that specific locale. Using the properties of this locale resolver, you can specify the name of the cookie, as well as the maximum age. Find below an example of defining a CookieLocaleResolver. cookieMaxAge Integer.MAX_INT The maximum time a cookie will stay persistent on the client. If -1 is specified, the cookie will not be persisted. It will only be available until the client shuts down his or her browser. cookiePath / Using this parameter, you can limit the visibility of the cookie to a certain part of your site. When cookiePath is specified, the cookie will only be visible to that path, and the paths below it. The SessionLocaleResolver allows you to retrieve locales from the session that might be associated with the user's request. You can build in changing of locales using the LocaleChangeInterceptor. This interceptor needs to be added to one of the handler mappings (see Section 13.4, “Handler mappings”). It will detect a parameter in the request and change the locale (it calls setLocale() on the LocaleResolver that also exists in the context). All calls to all *.view resources containing a parameter named siteLanguage will now change the locale. So a request for the following URL, http://www.sf.net/home.view?siteLanguage=nl will change the site language to Dutch. The theme support provided by the Spring web MVC framework enables you to further enhance the user experience by allowing the look and feel of your application to be themed. A theme is basically a collection of static resources affecting the visual style of the application, typically style sheets and images. When you want to use themes in your web application you'll have to set up a org.springframework.ui.context.ThemeSource. The WebApplicationContext interface extends ThemeSource but delegates its responsibilities to a dedicated implementation. By default the delegate will be a org.springframework.ui.context.support.ResourceBundleThemeSource that loads properties files from the root of the classpath. If you want to use a custom ThemeSource implementation or if you need to configure the basename prefix of the ResourceBundleThemeSource, you can register a bean in the application context with the reserved name "themeSource". The web application context will automatically detect that bean and start using it. By default, the ResourceBundleThemeSource uses an empty basename prefix. As a result the properties files will be loaded from the root of the classpath, so we'll have to put our cool.properties theme definition in a directory at the root of the classpath, e.g. in /WEB-INF/classes. Note that the ResourceBundleThemeSource uses the standard Java resource bundle loading mechanism, allowing for full internationalization of themes. For instance, we could have a /WEB-INF/classes/cool_nl.properties that references a special background image, e.g. with Dutch text on it. FixedThemeResolver Selects a fixed theme, set using the "defaultThemeName" property. SessionThemeResolver The theme is maintained in the users HTTP session. It only needs to be set once for each session, but is not persisted between sessions. CookieThemeResolver The selected theme is stored in a cookie on the user-agent's machine. Spring also provides a ThemeChangeInterceptor, which allows changing the theme on every request by including a simple request parameter. Spring has built-in multipart support to handle fileuploads in web applications. The design for the multipart support is done with pluggable MultipartResolver objects, defined in the org.springframework.web.multipart package. Out of the	box, Spring provides MultipartResolvers for use with Commons FileUpload (http://jakarta.apache.org/commons/fileupload) and COS FileUpload (http://www.servlets.com/cos). How uploading files is supported will be described in the rest of this chapter. By default, no multipart handling will be done by Spring, as some developers will want to handle multiparts themselves. You will have to enable it yourself by adding a multipart resolver to the web application's context. After you have done that, each request will be inspected to see if it contains a multipart. If no multipart is found, the request will continue as expected. However, if a multipart is found in the request, the MultipartResolver that has been declared in your context will be used. After that, the multipart attribute in your request will be treated like any other attribute. Of course you also need to put the appropriate jars in your classpath for the multipart resolver to work. In the case of the CommonsMultipartResolver, you need to use commons-fileupload.jar; in the case of the CosMultipartResolver, use cos.jar. Now that you have seen how to set Spring up to handle multipart requests, let's talk about how to actually use it. When the Spring DispatcherServlet detects a multi-part request, it activates the resolver that has been declared in your context and hands over the request. What the resolver then does is wrap the current HttpServletRequest into a MultipartHttpServletRequest that has support for multipart file uploads. Using the MultipartHttpServletRequest you can get information about the multiparts contained by this request and actually get access to the multipart files themselves in your controllers. As you can see, we've created a field named after the property of the bean that holds the byte. Furthermore we've added the encoding attribute (enctype="multipart/form-data") which is necessary to let the browser know how to encode the multipart fields (do not forget this!). Just as with any other property that's not automagically convertible to a string or primitive type, to be able to put binary data in your objects you have to register a custom editor with the ServletRequestDatabinder. There are a couple of editors available for handling files and setting the results on an object. There's a StringMultipartEditor capable of converting files to Strings (using a user-defined character set) and there is a ByteArrayMultipartEditor which converts files to byte arrays. They function just as the CustomDateEditor does. So, to be able to upload files using a (HTML) form, declare the resolver, a url mapping to a controller that will process the bean, and the controller itself. After that, create the controller and the actual class to hold the file property. As you can see, the FileUploadBean has a property typed byte that holds the file. The controller registers a custom editor to let Spring know how to actually convert the multipart objects the resolver has found to properties specified by the bean. In this example, nothing is done with the byte property of the bean itself, but in practice you can do whatever you want (save it in a database, mail it to somebody, etc). Of course, this last example only makes (logical) sense in the context of uploading a plain text file (it wouldn't work so well in the case of uploading an image file). The third (and final) option is where one binds directly to a MultipartFile property declared on the (form backing) object's class. In this case one does not need to register any custom PropertyEditor because there is no type conversion to be performed. Unlike other form/input tag libraries, Spring's form tag library is integrated with Spring Web MVC, giving the tags access to the command object and reference data your controller deals with. As you will see in the following examples, the form tags make JSPs easier to develop, read and maintain. Let's go through the form tags and look at an example of how each tag is used. We have included generated HTML snippets where certain tags require further commentary. The form tag library comes bundled in spring.jar. The library descriptor is called spring-form.tld. ... where form is the tag name prefix you want to use for the tags from this library. This tag renders an HTML 'form' tag and exposes a binding path to inner tags for binding. It puts the command object in the PageContext so that the command object can be accessed by inner tags. All the other tags in this library are nested tags of the form tag. This tag renders an HTML 'input' tag with type 'text' using the bound value. For an example of this tag, see Section 13.9.2, “The form tag”. This tag renders an HTML 'input' tag with type 'checkbox'. Defence Against the Dark Arts: <form:checkbox path="preferences.interests"
Approach One - When the bound value is of type java.lang.Boolean, the input(checkbox) is marked as 'checked' if the bound value is true. The value attribute corresponds to the resolved value of the setValue(Object) value property. Approach Two - When the bound value is of type array or java.util.Collection, the input(checkbox) is marked as 'checked' if the configured setValue(Object) value is present in the bound Collection. Approach Three - For any other bound value type, the input(checkbox) is marked as 'checked' if the configured setValue(Object) is equal to the bound value. Defence Against the Dark Arts: <input name="preferences.interests" type="checkbox"
What you might not expect to see is the additional hidden field after each checkbox. When a checkbox in an HTML page is not checked, its value will not be sent to the server as part of the HTTP request parameters once the form is submitted, so we need a workaround for this quirk in HTML in order for Spring form data binding to work. The checkbox tag follows the existing Spring convention of including a hidden parameter prefixed by an underscore ("_") for each checkbox. By doing this, you are effectively telling Spring that “the checkbox was visible in the form and I want my object to which the form data will be bound to reflect the state of the checkbox no matter what”. This tag renders an HTML 'input' tag with type 'radio'. This tag renders an HTML 'input' tag with type 'password' using the bound value. This tag renders an HTML 'select' element. It supports data binding to the selected option as well as the use of nested option and options tags. Let's assume a User has a list of skills. This tag renders an HTML 'option'. It sets 'selected' as appropriate based on the bound value. This tag renders a list of HTML 'option' tags. It sets the 'selected' attribute as appropriate based on the bound value. This tag renders an HTML 'textarea'. This tag renders an HTML 'input' tag with type 'hidden' using the bound value. To submit an unbound hidden value, use the HTML input tag with type 'hidden'. This tag renders field errors in an HTML 'span' tag. It provides access to the errors created in your controller or those that were created by any validators associated with your controller. Let's assume we want to display all error messages for the firstName and lastName fields once we submit the form. We have a validator for instances of the User class called UserValidator. Spring provides HandlerExceptionResolvers to ease the pain of unexpected exceptions occurring while your request is being handled by a controller which matched the request. HandlerExceptionResolvers somewhat resemble the exception mappings you can define in the web application descriptor web.xml. However, they provide a more flexible way to handle exceptions. They provide information about what handler was executing when the exception was thrown. Furthermore, a programmatic way of handling exception gives you many more options for how to respond appropriately before the request is forwarded to another URL (the same end result as when using the servlet specific exception mappings). Besides implementing the HandlerExceptionResolver interface, which is only a matter of implementing the resolveException(Exception, Handler) method and returning a ModelAndView, you may also use the SimpleMappingExceptionResolver. This resolver enables you to take the class name of any exception that might be thrown and map it to a view name. This is functionally equivalent to the exception mapping feature from the Servlet API, but it's also possible to implement more fine grained mappings of exceptions from different handlers. For a lot of projects, sticking to established conventions and having reasonable defaults is just what they (the projects) need... this theme of convention-over-configuration now has explicit support in Spring Web MVC. What this means is that if you establish a set of naming conventions and suchlike, you can substantially cut down on the amount of configuration that is required to set up handler mappings, view resolvers, ModelAndView instances, etc. This is a great boon with regards to rapid prototyping, and can also lend a degree of (always good-to-have) consistency across a codebase should you choose to move forward with it into production. The Spring distribution ships with a web application that showcases the convention over configuration support described in this section. The application can be found in the 'samples/showcases/mvc-convention' directory. This convention over configuration support address the three core areas of MVC - namely, the models, views, and controllers. The ControllerClassNameHandlerMapping class is a HandlerMapping implementation that uses a convention to determine the mapping between request URLs and the Controller instances that are to handle those requests. An example; consider the following (simplistic) Controller implementation. Take especial notice of the name of the class. The ControllerClassNameHandlerMapping finds all of the various handler (or Controller) beans defined in its application context and strips 'Controller' off the name to define its handler mappings. Let's look at some more examples so that the central idea becomes immediately familiar. In the case of MultiActionController handler classes, the mappings generated are (ever so slightly) more complex, but hopefully no less understandable. Some examples (all of the Controller names in this next bit are assumed to be MultiActionController implementations). If you follow the pretty standard convention of naming your Controller implementations as xxxController, then the ControllerClassNameHandlerMapping will save you the tedium of having to firstly define and then having to maintain a potentially looooong SimpleUrlHandlerMapping (or suchlike). The ControllerClassNameHandlerMapping class extends the AbstractHandlerMapping base class so you can define HandlerInterceptor instances and everything else just like you would with many other HandlerMapping implementations. The ModelMap class is an essentially glorified Map that can make adding objects that are to be displayed in (or on) a View adhere to a common naming convention. Consider the following Controller implementation; notice that objects are added to the ModelAndView without any associated name being specified. mav.addObject(user); <-- and again ma! The ModelAndView class uses a ModelMap class that is a custom Map implementation that automatically generates a key for an object when an object is added to it. The strategy for determining the name for an added object is, in the case of a scalar object such as User, to use the short class name of the object's class. Find below some examples of the names that are generated for scalar objects put into a ModelMap instance. A java.util.HashMap instance added will have the name 'hashMap' generated (you'll probably want to be explicit about the name in this case because 'hashMap' is less than intuitive). Adding null will result in an IllegalArgumentException being thrown. If the object (or objects) that you are adding could potentially be null, then you will also want to be explicit about the name). Spring Web MVC's convention over configuration support does not support automatic pluralisation. That is to say, you cannot add a List of Person objects to a ModelAndView and have the generated name be 'people'. This decision was taken after some debate, with the “Principle of Least Surprise” winning out in the end. An empty java.util.ArrayList will not be added at all (i.e. the addObject(..) call will essentially be a no-op). The RequestToViewNameTranslator interface is responsible for determining a logical View name when no such logical view name is explicitly supplied. It has just one implementation, the rather cunningly named DefaultRequestToViewNameTranslator class. The DefaultRequestToViewNameTranslator maps request URLs to logical view names in a fashion that is probably best explained by recourse to an example. Notice how in the implementation of the handleRequest(..) method no View or logical view name is ever set on the ModelAndView that is returned. It is the DefaultRequestToViewNameTranslator that will be tasked with generating a logical view name from the URL of the request. In the case of the above RegistrationController, which is being used in conjunction with the ControllerClassNameHandlerMapping, a request URL of 'http://localhost/registration.html' will result in a logical view name of 'registration' being generated by the DefaultRequestToViewNameTranslator. This logical view name will then be resolved into the '/WEB-INF/jsp/registration.jsp' view by the InternalResourceViewResolver bean. You don't even need to define a DefaultRequestToViewNameTranslator bean explicitly. If you are okay with the default settings of the DefaultRequestToViewNameTranslator, then you can rely on the fact that the Spring Web MVC DispatcherServlet will actually instantiate an instance of this class if one is not explicitly configured. Of course, if you need to change the default settings, then you do need to configure your own DefaultRequestToViewNameTranslator bean explicitly. Please do consult the quite comprehensive Javadoc for the DefaultRequestToViewNameTranslator class for details of the various properties that can be configured. Find below links and pointers to further resources about Spring Web MVC. The Spring distribution ships with a Spring Web MVC tutorial that guides the reader through building a complete Spring Web MVC-based application using a step-by-step approach. This tutorial is available in the 'docs' directory of the Spring distribution. An online version can also be found on the Spring Framework website. The book entitled “Expert Spring Web MVC and WebFlow” by Seth Ladd and others (published by Apress) is an excellent hardcopy source of Spring Web MVC goodness.